Have you heard of a turnip that would not budge?!! Yes, the story of 'The Enormous Turnip.' A tale of how a turnip grew so huge in ground that it hindered its own way to harvest. There was so much work involved that the gardener had to rope in the help of his family and animals to uproot it. We are excitedly looking forward to this upcoming play presented by i theatre's unique brand of professional actors, catchy songs, mask and puppetry. 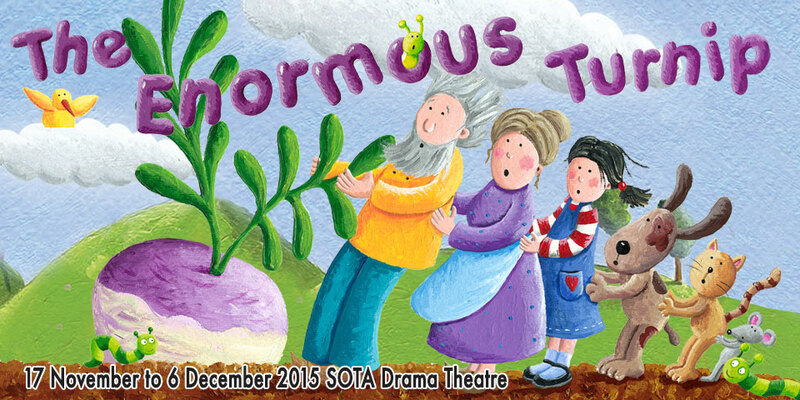 Catch the live tale of a tiny mouse and an Enormous Turnip. Little Eek the Mouse’s dream is to be noticed, but Eek is SO small. Will he ever be noticed and recgonised for any effort? Diggory the Gardener’s dream is to win a prize – any prize for his vegetables. And then, in his garden, a turnip grows, grows and grows! Where does it come from and what will he do with it? A fast paced, colourful, interactive play, carefully designed for the younger audience between ages 3 to 12, with cute characters, fun and memorable songs, and a clear moral message for everyone. Find out the answers in this play, coming live on stage this November. 2. Leave a comment on this Facebook post, telling us what your child's favourite tale (Any tale). 3. Together with your comment, tag 3 friends or more on the whom you think will be keen on this giveaway. This contest is closed. Thank you everyone for participating, we've picked a winner. Disclaimer: Sponsored post. All opinions and photos are solely ours.